When you bring your new golden into your home, one of the first bits of kit you’ll need is a collar. It’s right up there with a leash, high-quality food, and water bowls, a brush and toys. But, what collar should you get for your four-legged friend, and how should you go about choosing it? Buying the right collar for your golden retriever can be overwhelming, especially for a first-time dog owner. 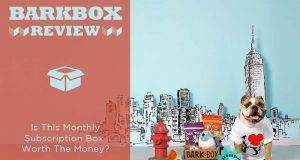 There are all kinds on the market, so it can be tough to know which is right for you and your dog. 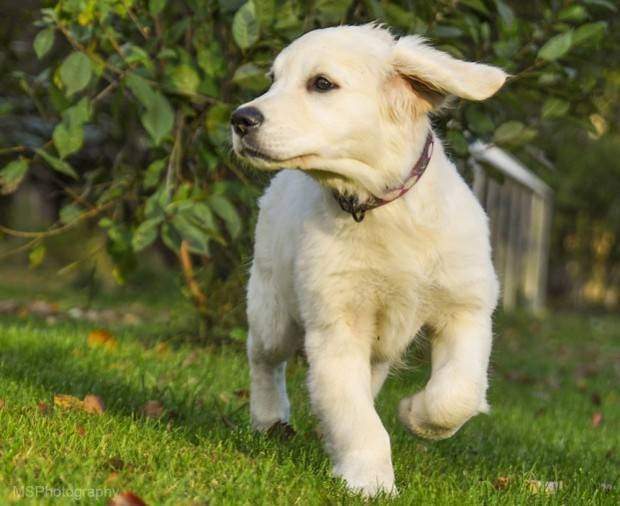 That’s why we’ve put together this list featuring ten of the best collars for golden retrievers, along with some handy general buying tips. You’ll soon be picking out a collar like a pro! To help you out, we’ve compiled this list featuring ten of our favorite collars for golden retrievers. That said, there are a lot of great collars out there, so if you don’t fancy any of the collars on this list, take a look for yourself. It’s always a good idea to look up online reviews or ask for recommendations from your local pet store, as this will give you an idea of the collar’s quality. 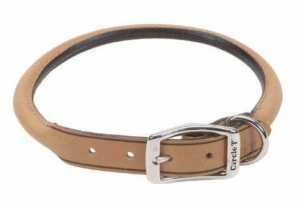 This soft leather collar comes in black or brown with a cream inner. What we like about it is the good amount of soft padding on the inside, so it’s comfortable for your dog. 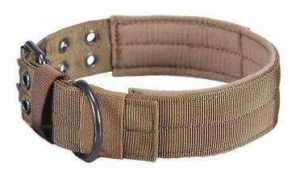 It also has a strong brass buckle fastening and D-ring, both of which are stitched in well and should be secure even if your dog pulls hard on the lead (that said, if your golden is a habitual puller, it’s better to attach their leash to a headcollar or harness to avoid neck damage). In size large, this collar is 1.5 inches wide and fits necks with a circumference of between 18 and 21 inches, which should be sufficient for most golden retrievers. 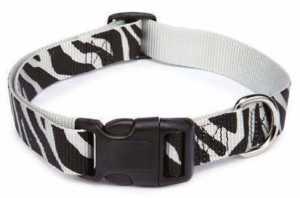 This stylish collar is made from a durable nylon, with a comfortable padding on the inside. It comes in three colors: a nice coyote brown, ranger green, and black, and has a badass-looking metal buckles and reinforced holes, making it stand up to plenty of wear and tear. Another feature is that it has a panel that you can embellish with patches and whatnot to make the collar unique. The large size fits necks of between 17.7 to 20.9 inches. This rolled leather collar from Dogline is ideal for anyone who wants a classic looking collar for their dog, and who might be concerned about a flat collar breaking fur. 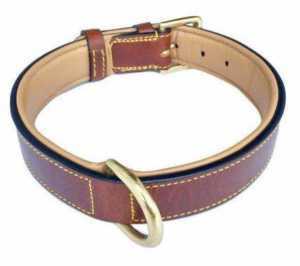 There are a number of different sizes available, so you’ll be sure to find a collar to fit your golden. But, maybe more exciting is these collars come in a huge range of colors, from basic black and brown to bold blue, red and purple. They’re made in the USA and seem to be of extremely good quality, getting consistently good Chewy reviews. This one’s certainly going to turn heads at the dog park, but it’s not all style over substance. This collar is tough and waterproof and cleans in seconds. It’ll never smell and has a gorgeous buckle that won’t rust. 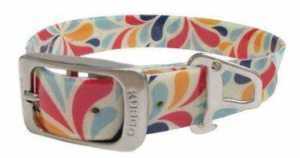 It’s the perfect collar for athletic and adventurous dogs with a fun and funky fashion sense. This adjustable collar in large fits necks of any circumference between 20 and 25 inches, but does come in smaller sizes, if you have a puppy or an adult golden with a slimmer neck. 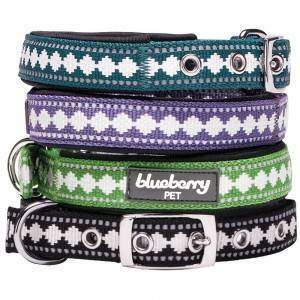 This neoprene collar from Blueberry Pet is tough and durable, while still being soft and comfortable for your dog. The interior is even padded to provide extra comfort. Although this is a fairly basic collar, what we like about it is the choice of colors in an attractive jacquard pattern and the fact it has some reflective stitching, which makes it great for late-night walkies. 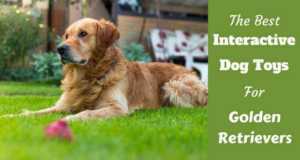 The large size should fit most goldens, as it’s designed to fit necks of 17 to 21 inches in circumference, but, as ever, we’d recommend measuring your dog’s neck before making a purchase. This collar is handcrafted using premium leather and a comfortable padded lining. It’s also handmade in the USA, which is perfect for those who like to buy American. The hardware is also sourced in the USA, and is tested for durability. The large size of this collar is 1.38 inches wide and fits necks with a circumference of up to 21 inches. They have an even bigger size that’s 1.5 inches wide and 27 inches long. This collar from EzDog was designed with the active dog in mind, so it’s highly durable and can stand up to the elements and all the swimming, running and getting dirty that your golden can manage. Another central design point was its comfort, it has soft neoprene padding and should be pleasant for your dog to wear even on all day hikes. Although it’s comfy and lightweight, it’s extremely hard-wearing with a snap-on closure and adjustable velcro straps. It should last for years, even with repeated exposure to moisture. The reflective piping gives you some extra safety and peace of mind for after-dark excursions. It’s made with high-quality nylon and a quick-release plastic closure. 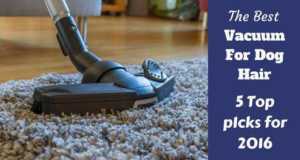 It is sturdy and machine washable. It has a sturdy nickel-plated buckle, D-ring and grommets in the holes for extra durability. This collar is 1 inch wide and the largest size will fit necks of up to 27 inches. This rolled collar from Circle T is made of high quality leather that’s been vegetable tanned. It also has a leather core which helps ensure it won’t lose its rolled shape. As mentioned above, rolled collars may be better if you plan on leaving your golden’s collar on all day, as some people report hair matting or breakage from flat collars on longer coated dogs. The version linked above is tan in color, but there are other shades available, such as dark brown and black. If you’re looking for a quality leather collar that’s a bit more fun in appearance than most plain leather collars, this collar from Perri’s might be the one for you. They come in black with silver hardware or black with bronze hardware, but then you get to choose from a range of options when it comes to to inner padding. You can go for bright pink, turquoise, hunter green or even a snakeskin print. Not only is the padding decorative, it also makes these collars more comfortable for your dog and less likely to rub or break hair. These collars are Amish made in the USA to a very high standard. What Is A Dog’s Collar For, Anyway? This might seem like a silly question, but it’s good to start with the basics! What is a dog’s collar for and why do they need one? One of the primary purposes for many people is to attach a leash for walking their dog. However, not everyone walks their dog on a collar. Many people opt to use a harness or halter to walk their dog, as they can offer more control or increased comfort for the dog. So, does your dog still need a collar? In short, yes. The main reason your dog should always be wearing a collar when they’re out is so that if they get lost, they have an ID tag with your name, address and contact details on it. Your pup should be wearing a tag even if they’re micro-chipped, because any good Samaritan can read this info, whereas they would have to be taken to a vet’s office or animal control to have their microchip read. In some areas, it’s even a legal requirement for your dog to be wearing this kind of tag. In places where licensing your dog is an option – or a requirement – you’d also need to affix the license to their collar. 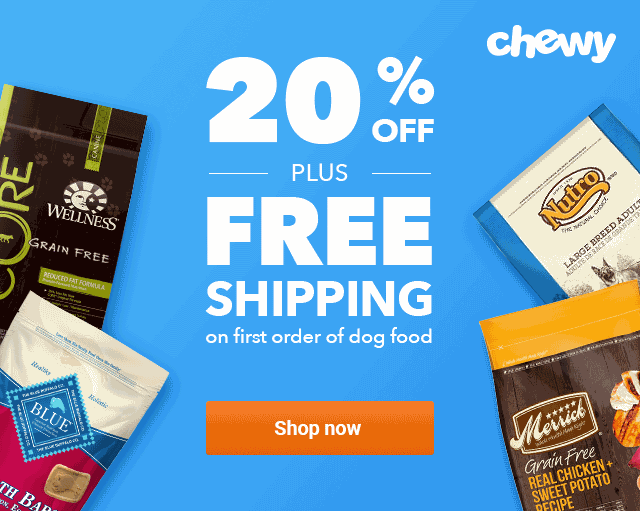 Should Your Golden Retriever Have A Flat Or Rolled Collar? When it comes to regular snap or buckle collars — which we believe are the best, safest and most humane option for your canine companion — there are two main types: flat and rolled. So, which one is best for a golden retriever? The jury’s out on this one, but we’ll go through the arguments. Some people claim that rolled collars are the best option for long-coated dogs, because flat collars can rub long fur and cause breakage. The more collar in contact with the coat, the higher the chance for fur breakage. However, other people use flat collars on long-coated dogs and report no rubbing away or breaking of fur whatsoever. If you’re planning on having your golden wear their collar all day, we’d recommend going with a rolled collar, to minimize the chance of damage to their fur. On the other hand, if your dog only wears their collar when out on walks, it’s unlikely a flat collar will break their fur. In which case, choose whichever variety you prefer. How Wide Should Your Golden’s Collar Be? As a large breed, golden retrievers need fairly wide collars. This is for reasons of both strength and comfort. When choosing a flat collar, pick one that is at least 1 inch wide, but probably no more than 1.5 inches. Rolled collars are measured according to the width of the material before it’s rolled. Again, a width of between 1 and 1.5 inches is ideal, but don’t be surprised that the rolled part is actually thinner than this. 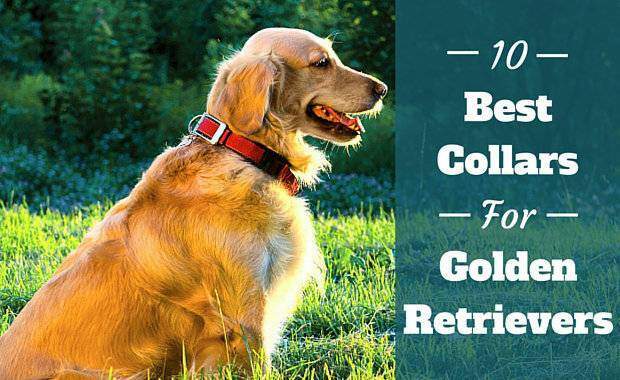 How Long Should Your Golden’s Collar Be? The ideal length of collar for your golden retriever will obviously depend on the circumference of your dog’s neck. Depending on various factors including age, weight, muscle mass, and more, the size of a golden’s neck can vary by quite a large degree. But the average neck size is 18″ to 22″, though it can go as low as 15″ and as high as 24″. Your best bet is to measure around your dog’s neck with a cloth measuring tape. Remember, that the fit of a collar shouldn’t be pulled tight, you should be able to fit a couple of fingers between your dog’s neck and their collar. Bear this in mind when doing the measuring so that you get a good fit. When you go to pick a collar for your golden, don’t just grab the first thing you see that seems vaguely suitable. Put some thought in to pick a collar that’s going to be safe and comfortable for your dog. 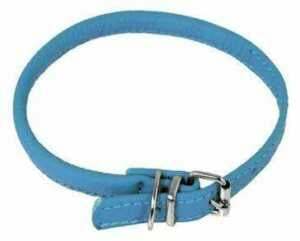 Choose a collar of an appropriate size and weight. The exact choice will depend on your dog. For instance, if you have a puppy, a thinner, lightweight webbing collar is best, whereas for an adult golden, you want something strong enough, that’s still going to be comfortable. Pick a regular flat or rolled collar. We absolutely would not recommend using any sort of correctional collar, such as a choke chain or prong collar. Not only are they generally inhumane and not in keeping with a positive reinforcement approach, they can do some nasty damage to your dog’s neck and windpipe. Select your fastening of choice. Most collars have either snap or buckle fastenings. There’s no right or wrong choice here, so select whatever you prefer. That said, for a puppy, snaps can be better as it’s quicker and easier to get the collar on and off. Make sure you get a well-fitting collar. If you’re buying a collar for a young dog, make sure you get one that fits well now, not something they can grow into. As said above, you should measure around your dog’s neck before buying so that you get a collar that fits correctly. For a comfortable fit, you should be able to get two fingers in between your dog’s neck and the collar. There isn’t one single collar that’s head and shoulders above the rest. Any from above list of 10 best collars for golden retrievers would do nicely, and there are also more good options out there. As long as you follow our buying tips and make sure the collar is sturdy enough for your golden and fits them nicely, you should have a good collar on your hands. I just wanted to thank you for going over some options for golden retriever collars. It’s good to know that the length of the collar depends on how big the neck is. It sounds like it could be good to check on this often, especially if your dog is growing so you can pick out something that will make them comfortable.